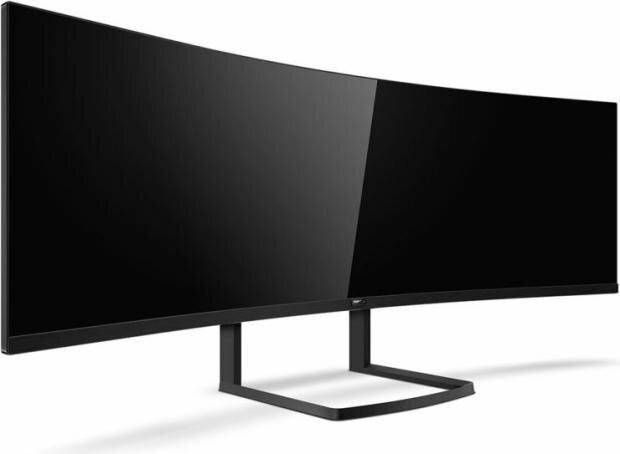 Philips will release its huge 49-inch 32:9 display towards the end of the year, native res of 5120 x 1440 By: Anthony Garreffa | Displays & Projectors News | Posted: Mar 15, 2018 2:36 am Comment | Email to a Friend | Font Size: AA Philips has announced that its massive 49-inch 32:9 display with a native resolution of 5120 x 1440 will be released later this year in the US, launching in Q4 2018. The upcoming Philips Brilliance 49-inch 492P8 Curved Super-Wide LCD will be priced at $899, and beats out Samsung's CHG90 that rocks a native resolution of 3840 x 1080. Inside, Philips will be using the same VA panel with an 1800R curvature, 600 nits max brightness, 5000:1 contrast ratio, and 178-degree viewing angle. Connectivity wise, Philips will be including DisplayPort, HDMI, USB-C, VGA (D-Sub), USB 3.0 Type-A, and Ethernet. The desired function is 4 picture by picture.